Make an Energy 1st replacement door the centerpiece of your home. 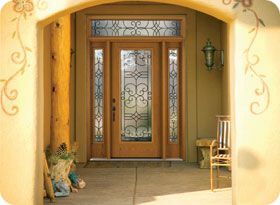 Our premium fiberglass doors feature the alluring look of wood but last much longer with little maintenance, even in the Southwest's intense climate. With a variety of styles and finishes to choose from (including flush glazing), saving energy has never looked so good. Since our fiberglass doors are ENERGY STAR® qualified you will start saving money the day we install them for you. All fiberglass door replacements include the complete tear-out of your old door and frame, installation of the new custom-built, pre-hung unit, disposal of old doors, a thorough clean-up of your property and a lifetime warranty. You can count on CHS of AZ for quality products, competitive prices and friendly service. Our team of experienced professionals focus on excellent craftsmanship and provide top-notch customer communication from start to finish. Request a quote online today and get an additional 10% off!